For something slightly more exotic in your tumbler, why not pour yourself a glass of our delicious tropical juice? A combination of pineapples, passion fruits, mangoes, oranges and apples, it’s guaranteed to make the sun shine (most of the time). We promise that our juice will always be refreshingly innocent because it is never concentrated and never sweetened. Not now, not ever. 1 of your 5-a-day. Pure squeezed fruit, nothing else.A combination of pineapples, passion fruits, mangoes, oranges and apples. 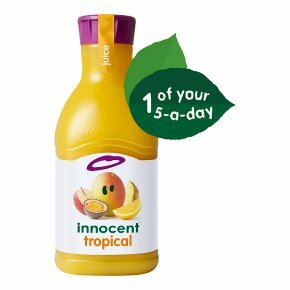 - it's never concentrated - blend ofapples, oranges, pineapple, mango & passion fruit in every 1.35l carafe - 1 portion of fruit in every 150ml serving Our innocent promise: 1. Tasty healthy products* - 100% pure fruit juice. No concentrates. No funny business. 2. Sourced sustainably - we use recycled & recyclable packaging, refuse to air freight and source ethically. 3. 10% of profits go to charity - find out more at www.innocentfoundation.org innocent drinks. Tastes good, does good. *This juice is a source of Vitamin C which contributes to the normal function of the immune system. Enjoy as part of a healthy lifestyle and balanced diet. PS Eat your greens. This juice has been gently pasteurised, just like milk. Shake it up.